It’s been quite a few months since I’ve pulled out the old sewing machine. Unfortunately, it was being cantankerous and not switching over to the regular functions after winding the bobbin thread. After about 15 min of fiddling, it magically went into regular stitch mode. 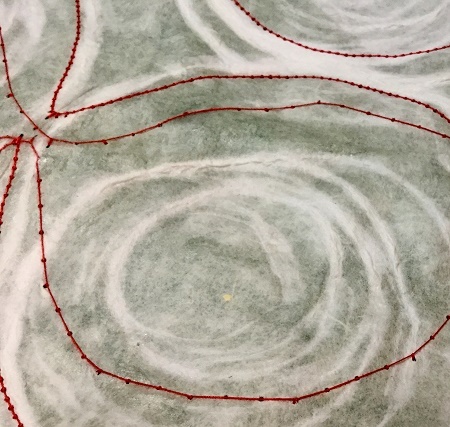 I “doodled” over the paper using red thread. Not certain if it’s a winner yet, but I’ll keep moving this through the process. It’s all an experiment right now. Tomorrow is the big MRI day. I wish it could be scanning both feet/ankles, but they are going for the original injury site. My therapist and I are keeping our fingers crossed that something productive will come out of this scan. With my luck, it will be nothing conclusive. I just wish I could function without pain. Maybe someday soon! When a sewing machine goes awry, it sometimes produces interesting results…not good for clothing production, but may be good for an art piece… just sayin. Good luck with medical procedures!! Thanks Rose. Yes, me too. Fortunately today it’s feeling pretty good. It’s either major scar tissue or a neuroma, or both, or nothing at all…. Crikey, that’s a lot to sort out. Getting a diagnosis is half the battle. Fingers crossed for you! Having chronic pain is such a tragedy, so hopefully something conclusive! Paper stitching is such a fun thing!! Gale so sorry to read about your on going pain! Love your work you share here.